Being a nighthawk or night owl myself, though the noisy chatter of warring of birds in the early morning can hamper my love for them, I am generally enthralled by these celestial flight beings. Ah, to be a bird. I have dreamt of flying many a time, especially in my youth and childhood, and most often as a flying horse, but, I do imagined the thrill of taking flight without getting on a plane. Since I can recall, I have found cattails (or bulrushes) fascinating for some reason. They are a beautiful thing to me, somehow. 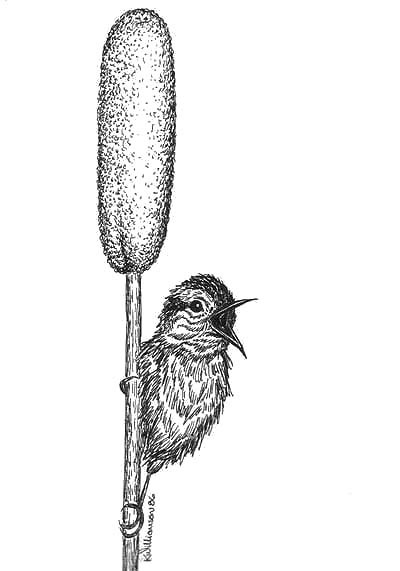 And so, a little bird clinging to a cattail is a pretty sight in my mind. And, a bird perched on a type of cat hints of some kind of irony too. He looks so happy! This one is my favorite. Thanks! Yes, some kind of a happy songbird!